WE SEE it on TV and hear it on the radio: the celebrity matches made in heaven that more often than not come crashing back down to earth. But what is it about relationships now that just doesn't seem to work? So many young people tie the knot only to hit the splits. Not too long ago, this kind of see-sawing decision to divorce or separate was very rare. Some of our more senior citizens may just hold the key to unlocking the secret formula to a successful marriage and relationship longevity. And you don't have to look too far to see that many of our own Sunshine Coast residents are living proof that a lasting relationship may indeed be easier to maintain than you think. Jim and Joy Kikos, of Cotton Tree, married in their early twenties and have lived together happily for the past 53 years. They believe relationships in the modern era aren't going the distance due to the approach that young people have on their relationships - in particular, the instant need for gratification. "I don't think people are willing to work for a relationship anymore," Joy said. "People these days want something and are not prepared to wait. "Young people want something and they want it now. So when it doesn't work, they just say forget it (the relationship)." Joy's husband Jim said that a big difference between the youth of today and his generation was their work ethic and in particular how hard people had to work to earn a dollar. "I came out here from Greece and I was prepared to work," Jim said. "It's the same thing with my wife. I worked for her as well." A change of attitude towards life and relationships seems to be a resonating theme for older couples who believe that financial reasons have a lot to do with the downfall of the modern relationship. 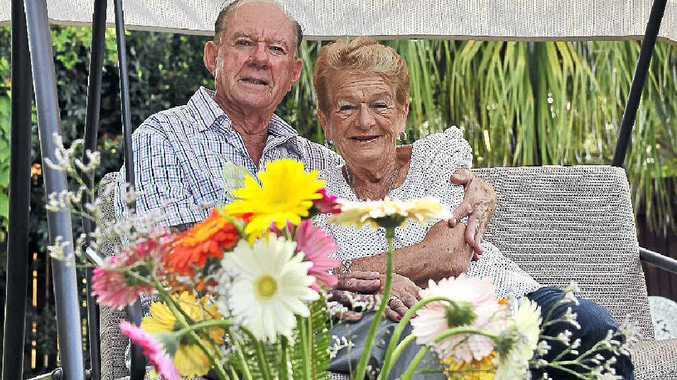 Lance and Judith Doughty, of Maroochydore, celebrated their 50th wedding anniversary over the weekend and they both believe that when it comes to relationships, they just don't make them like they used to. "Money has a lot to do with it," Lance said. Judith added: "We don't owe anybody anything. We didn't have the plastic cards like you do today - we had to save." The couple said they also believed that no relationship was perfect and that no matter what your age, couples could make their relationship work if they kept things simple. "It's important to talk your problem through instead of saying, 'That's it. I'm finished' and walk out," Judith said. "We have many an argument. "Sometimes we scream and rant and rave with each other, but we get over it. "It's not worth leaving home for. "The love is still there." The couple has called Maroochydore home for 26 years and their advice for the younger generations considering marriage couldn't be simpler. "Develop trust and be tolerant with each other," Judith said. Lance went further: "Never go to bed with an argument on your mind because you wake up and it's still there. "It's all about give and take."